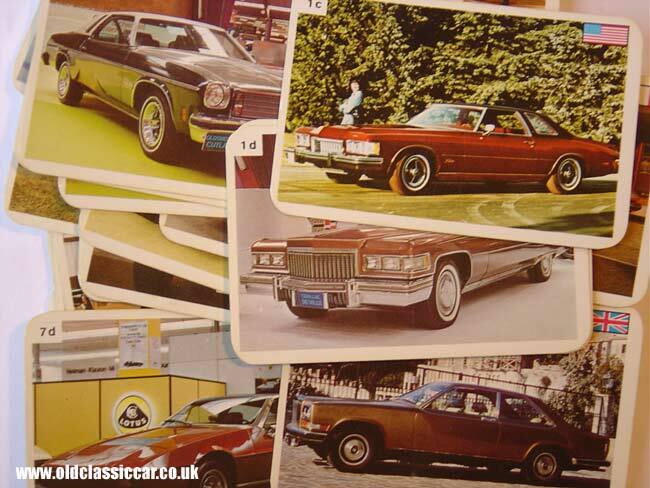 Who remembers this car card game? These addictive playing cards are still available, but surely their heyday was back in the 1970s and 1980s, when eager children tried to out-do each other with their particular 'hand' of top trump cards. I was given this set when I was knee-high to a grasshopper, and for some reason I could never bring myself to chuck it away. Where my other sets are I really don't know - dragsters, motorcycles, Grand Prix cars and more all had their own sets, full of makes and models you'd never heard of. The idea of the game was to win all the cards if I remember right - two or more players would take it in turn to choose what they thought was the strongest feature about the vehicle on their top cards. This might be top speed, engine capacity, power (bhp), fuel consumption or some other fairly useless fact. If your car was 'better' than your rival's, you won their card, and took another turn with the next card in your pack. I remember in another set I had, there was a silver coloured Ford sportscar and that would win on virtually everything - power, top speed, engine cc, and so on - it was the card everyone wanted to have in their hand. As with all the Top Trumps sets I had, this one is definitely from the 70s. Unlike the others though, the specification for each car is on the reverse of the card, whereas the other sets I had featured both picture and spec on the same side. All manner of cars feature in this pack, including Buick Riviera, Mercedes Benz 350SL, 600 Limo, 350SE, BMW 3.0CSL, Porsche 911 RS, Monteverdi High Speed 375 & Hai 450 SS, Rolls Royce Corniche & Camargue, Jaguar XJ6 (Series 1) & XJS, Oldsmobile Cutlass, Bitter CD (nice), Citroen SM (hmmm), Alfa Romeo Montreal, Lamborghini Urraco P250 & Countach, Maserati Bora, Lancia Stratos, Ferrari 365 GT 4 & GTB/4, Lotus Elite (wedge), Daimler Pullman (aka DS420), Panther (SS100 lookalike-ish), Chrysler New Yorker, Chevrolet Camaro, Pontiac Firebird, Chevrolet Caprice (ain't pretty), and the Cadillac Fleetwood Eldorado. One car that I've never heard of, and featured by Top Trumps, is the Bricklin - a rakish and claustrophobic looking 2 door wedge. The handy information on the back of the card tells the spotty-faced player that it was powered by a V8 (no surprises there then), of 5897cc, and produced 220bhp. Other fascinating facts, such as its turning circle (10.4m) and the size of its oil tank (4.7litres), are also kindly proferred. A little nosey around the www brings up some interesting info on the Bricklin - not least the fact that it was a gullwing car, and that it nose-dived somewhat despite the efforts of its Canadian creator, a Mr Bricklin. In fact there is a hint of De Lorean style success in this story, from what I read. Whereas the DMC featured a stainless steel body, the Bricklin SV1 had a bodyshell built from acrylic and glass-fibre. Its target market was the USA. They were designed to be a safe vehicle, in a time when automotive design in the states was rapidly embracing safety technology for the first time in any great measure. Over 2800 Bricklins were built before the company went bump, and there is an interesting owners club website right here: Bricklin International Owners Club.